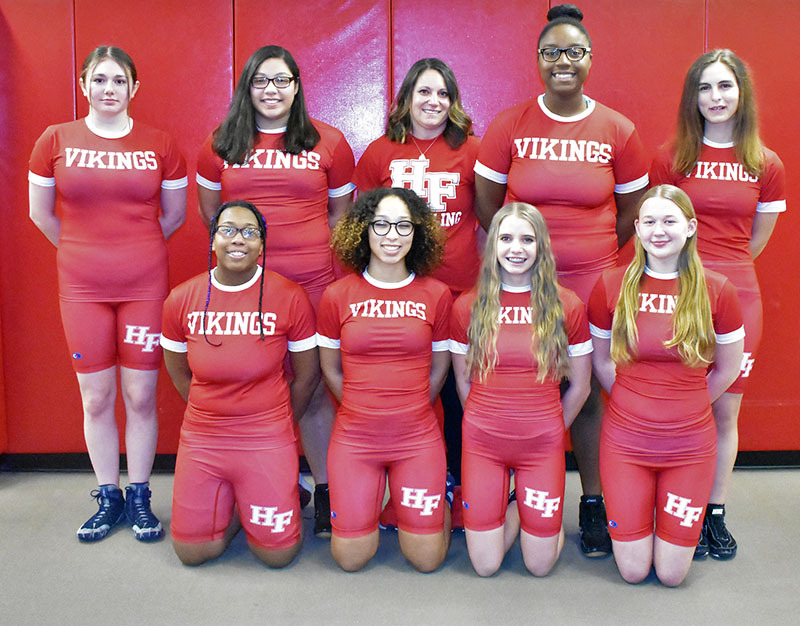 This school year, a group of Homewood-Flossmoor High School female athletes has coalesced into organized wrestling team, and they are now looking to expand girls wrestling as an official sport. The H-F wrestling program is co-ed, and last fall Varsity head coach Shannyn Gillespie started an ad campaign to bring more girls into the sport. The campaign helped Gillespie recruit a couple of female wrestlers. This year things have greatly expanded, with 11 girls on the wrestling squad. “If we promote well and we get it around how fun (wrestling) actually is, I think more girls will be willing to join,” said H-F junior wrestler Jayda Phillips. "And that’ll make it better for other girls around the state and the country." Gillespie is a member of the Illinois Girls Wrestling Coaches Alliance, a group with a membership of nearly 90 high school coaches throughout the state. The IGWCA’s goal is to promote and expand girls wrestling programs throughout Illinois. At H-F, Gillespie and the female athletes hope to get a designation for girls wrestling as its own sport, separate from boys wrestling. The higher number of female wrestlers joining the team has already allowed H-F to host girls wrestling events. “I knew that if we were able to get enough coaches involved we could create tournaments and opportunities for (the girls) to compete,” Gillespie said. At H-F’s first ever girls festival on Nov. 21, 2018, 80 female wrestlers from 12 different schools competed. Another tournament H-F hosted on Dec. 29 drew 90 girls from 25 schools. Last year there were 446 girl wrestlers in the IHSA. This year, there are 621, meaning nearly one-sixth of the high school girl wrestlers in Illinois participated in the H-F invite. “That’s crazy. Around one-sixth of the girls were at Homewood-Flossmoor wrestling,” Gillespie said. "So I feel really good about our program and I’m certain we can double the number of participants that come out for the team next year." In the wrestling postseason, girls compete against boys, but boys qualify for a majority of the spots at state. In the history of IHSA wrestling, there only two girls have qualified for state competition. With enough female wrestlers, however, girls can compete against other girls during the regular season. To officially add girls wrestling as an IHSA-sanctioned sport, 10 percent of Illinois schools need to have teams participating in the sport. “I know if girls get a state tournament in Illinois through the IHSA, then we’ll have a lot of girls going off to college and maybe going to world championships or the Olympics,” Gillespie said. During an IHSA meeting in April 2017, girls wrestling was called “an emerging sport” and it has proven to be so. One statistic shows girls wrestling has increased by 270 percent over the last eight years. Junior Abigail Krakar, also a girls varsity cross country team member who wrestled outside of school, describes wrestling as “a hands-on sport and it’s more brutal than most sports. You get injured more often, too. It’s just different,” Krakar said.